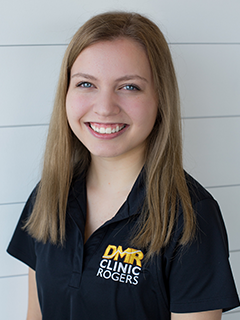 Dr. Michlynn Heide, DMR Clinic Rogers’ local chiropractor, grew up in Burnsville, Minnesota. She earned her Bachelors of Science degree in Human Biology along with her Doctorate of Chiropractic from Northwestern Health Sciences University in April 2009. Dr. Michlynn has extensive experience in treating a variety of spinal conditions, along with advanced training treating soft tissue injuries and headaches to improve overall health and wellness. 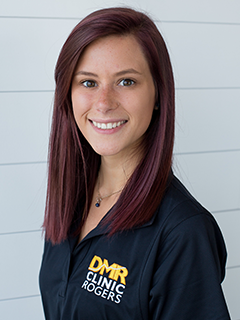 She is passionate about working with an integrative wellness team to provide comprehensive treatment for her patients through chiropractic treatments as well as physical therapy and more with the DMR Method. Her mission is to create a healthy community by educating and empowering as many people as possible to experience optimal, pain free health. DMR Clinic Rogers’ local chiropractor, Dr. Michlynn and her husband, Dale, love spending time with their daughters, Ava and Raegan, Ranger the dog, and flock of Welsh Harlequin ducks. Outside of the local chiropractor clinic, you may spot Dr. Michlynn and her family exploring a local farmer’s market, perusing vintage shops, or enjoying the great outdoors. 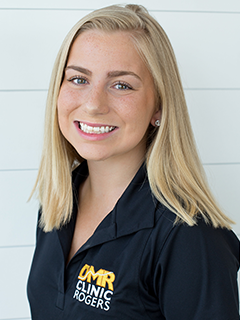 Julie grew up in Rogers, MN and has enjoyed watching the town grow from a small town to a bustling suburb. 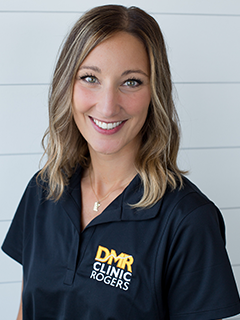 She graduated from a physical therapy program in The Netherlands in 2002, where she received a very holistic and integrative education focused on superior patient care and rehabilitation. She worked for many years with children with developmental delays in The Netherlands and South Africa. Then moved back to Rogers to be closer to her family. 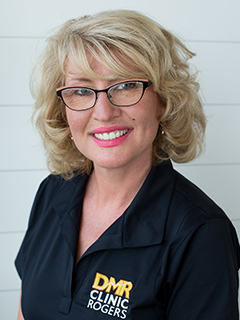 She has worked primarily in transitional care, home care, and skilled nursing facilities for the last 6 years. 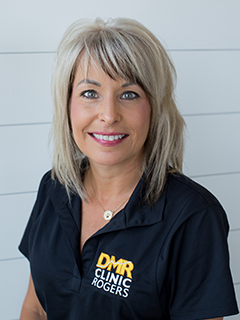 She is skilled in manual therapy and deep tissue massage to reduce pain and improve function. Julie lives in Rogers on the Crow River with her husband, 2 children, and multitude of pets. Her hobbies include camping, travelling, walks/hikes in nature, maintaining her small vineyard, and gardening. Aaron has been a long time carpenter, restaurant cook, and a server for an Italian restaurant. He spent almost 20 years as a carpenter, building and remodeling homes for people. After which he desired he needed a career change and decided to go to college. That is when Aaron pursued and completed, with honors, his degree as a Physical Therapist Assistant from Anoka-Ramsey Community College. He graduated in May of 2017, passed his boards, and received his license in July of 2017. 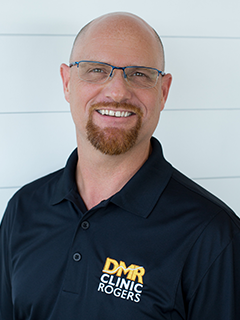 Beginning his newfound career, DMR Clinics is where he has been practicing since September 2017. 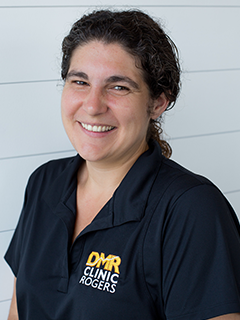 He has been helping people get better, at the DMR Clinic Woodbury, Hopkins Health & Wellness Center, and now with Dr. Michlynn and her team at DMR Clinic Rogers. When Aaron is not working, he enjoys spending time on Rainy Lake with his wife and 2 teenage boys. He also enjoys camping in the BWCA, fishing, and cooking food over a campfire. 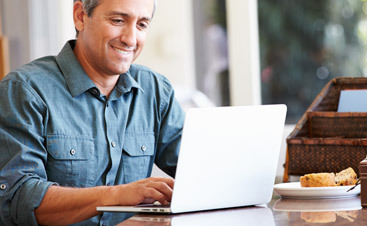 My goal, as a therapist, is to help patients live healthy and productive life . 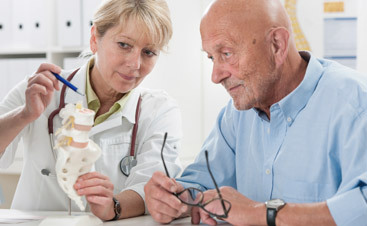 Physical therapy is not only my occupation ; it is my passion. My ultimate life’s motto is : Keep Smiling and Celebrate Life Every Day . Interesting fact about me . My family and I Immigrated from Belarus( one of the republics of the former Soviet Union ) My husband Alex and I have two daughters and eight year old yellow Labrador AJ . We enjoy outdoor activities and travel the world learning about new cultures and traditions . Dale is the office manager at DMR Clinic Rogers. Prior to opening the clinic with his wife, Dr. Michlynn, he had over a decade of building and remodeling custom homes, traveling the country installing English conservatories and working with one of the Twin Cities’ top granite companies. Whether acting as owner or employee, his experiences reinforced his belief that doing right by people is what is most important. 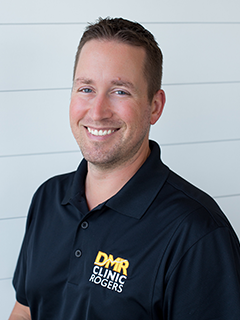 He strives to bring that earnestness and sense of personal responsibility to everyone on the team at DMR Clinic Rogers, and giving patients peace of mind about their care. Dale and Dr. Michlynn live in Nowthen with their 2 daughters, and 2 dogs. When Dale isn’t working on clinic business, he enjoys building custom farmhouse and rustic furniture, hunting, and spending time with his family. You’ll find him spending weekends with his ladies, pursuing local vintage sales, or out in the woods with the dogs.